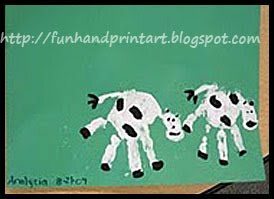 To make the Handprint Cow: make a white handprint and then add the ears, tail, and a small oval under the tip of the thumb. Let it dry for about 5 minutes and then use black or brown paint to give the cow spots, hooves, and facial features. To make the Handprint Duck: make a yellow handprint and paint a yellow circle at the tip of the thumb to create the face. Paint or draw on orange feet and a beak, and a black wing outline. 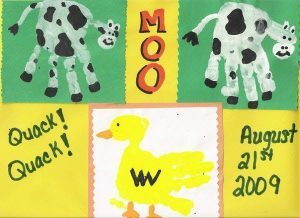 You may also like these farm animal crafts.